Known by many names, the tower on Patterson Boulevard in Kettering near Hills and Dales Park has been the source of many legends and stories over the years. The theories of its origin and hauntings vary as much as its name. 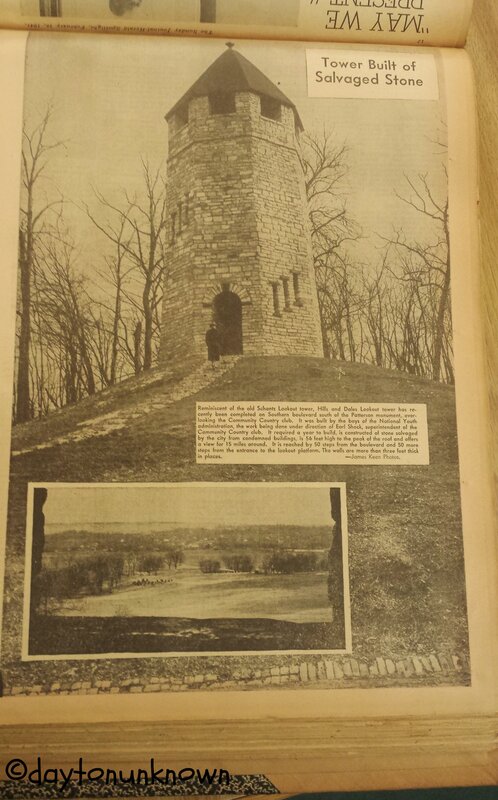 Growing up in Kettering, we have heard many rumors of the tower and its past. One interesting (and far-fetched) story was that the tower was built during the Civil War, and that a woman climbed to the top and plunged to her death after hearing the news of her husband’s death. The most popular story circulating was one of teenagers seeking shelter from the storm, and lightning hitting the tower, killing them all. 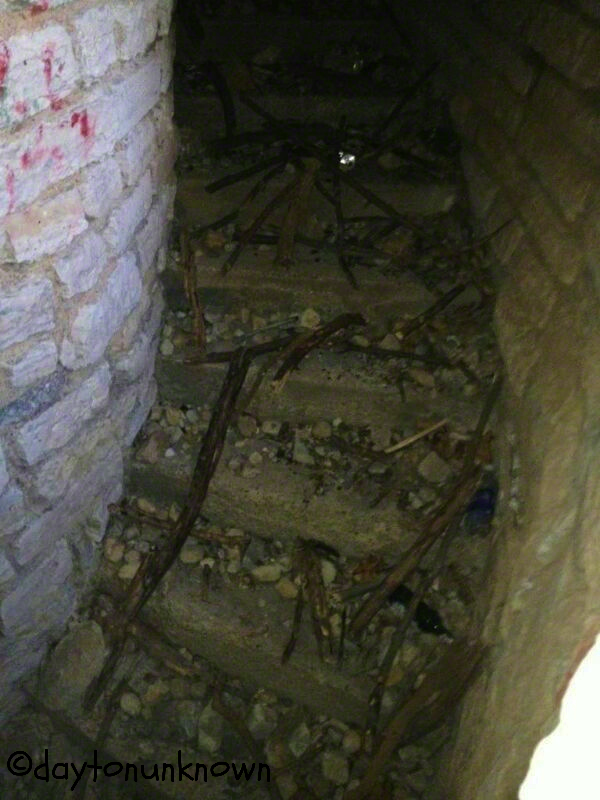 The inside steps of the tower. To protect the innocent, we did not take this picture, but Dayton Unknown has been given the rights to the photo. So what is the truth? Dayton Unknown did research! We found articles to verify that there was in fact one death in the tower, Peggy Harmeson. 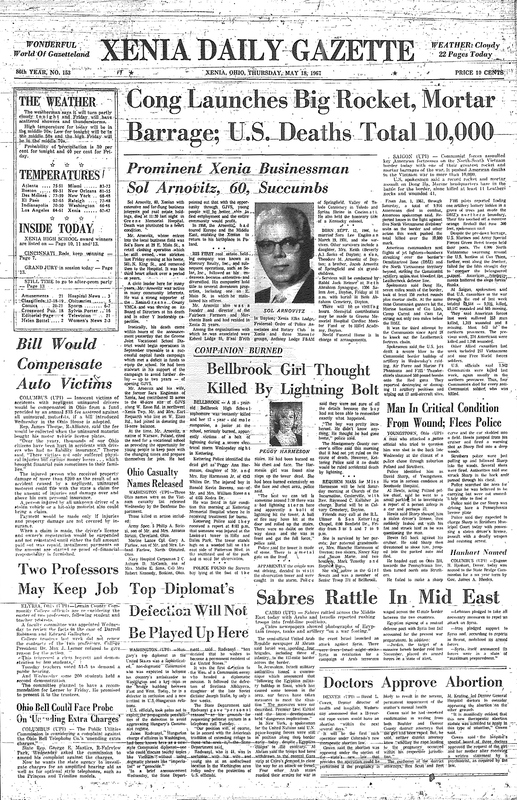 This article appeared on the front page of the the May 18, 1967 Xenia Daily Gazette. You can see the front page here. On May 17, 1967, Peggy and her boyfriend sought shelter in the tower from the rain. 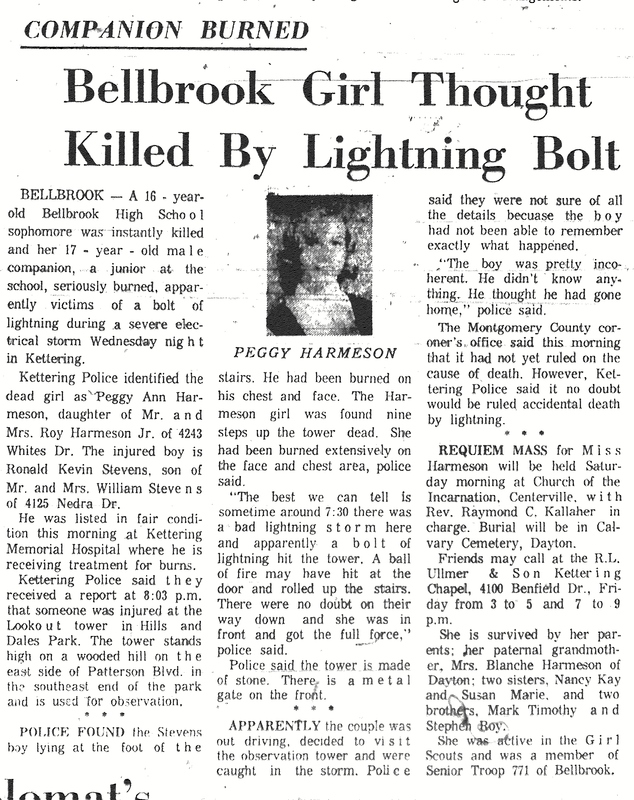 Lightning struck the tower, killing 16-year-old Peggy and rendering her boyfriend unconscious. This is the only verified death in and around this tower. 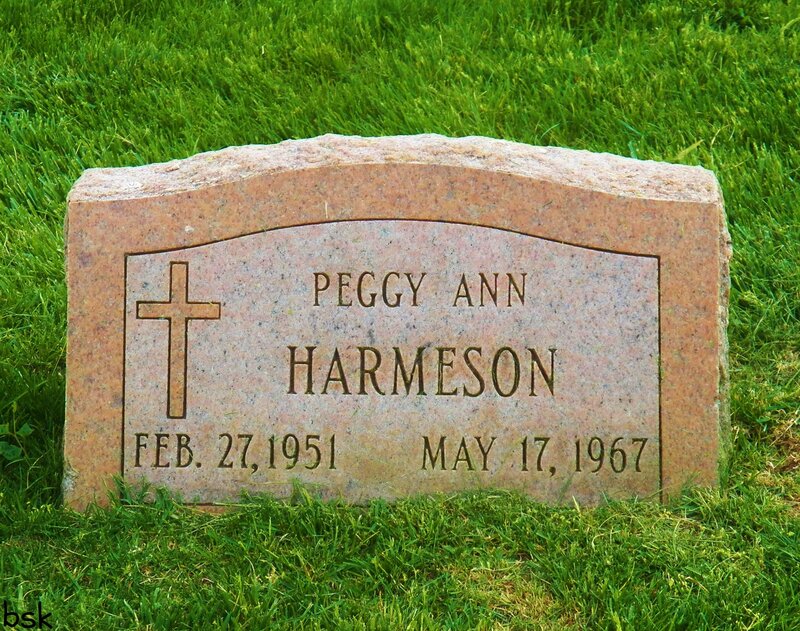 Peggy’s gravestone at Calvary Cemetery in Dayton. The building of the tower is straight-forward. Construction on the Hills and Dales Lookout Tower started in 1940 by the boys of the National Youth Administration. The tower was made from the salvaged stone of condemned buildings in the Dayton area. The year-long project resulted in a tower which was 56 feet high (before the roof came off) and has walls 3 feet thick. 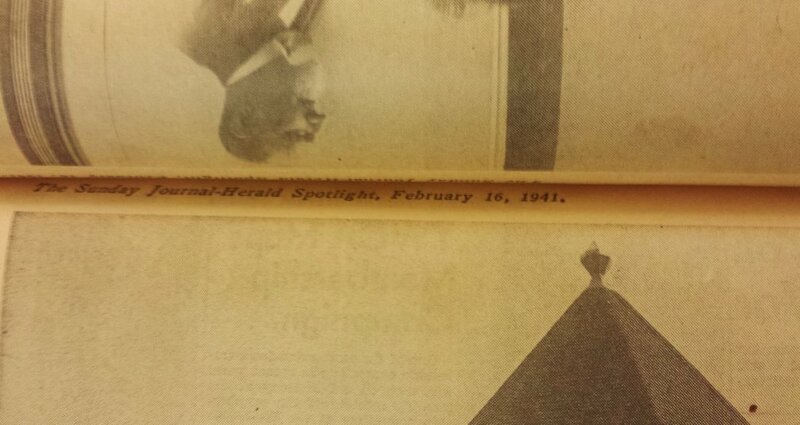 This article appeared in the February 16th, 1941 Dayton Journal-Herald. Although the true story of the tower isn’t scary or sensational, teenagers will still probably continue to drive past it at night, in hopes of seeing something beyond this world. 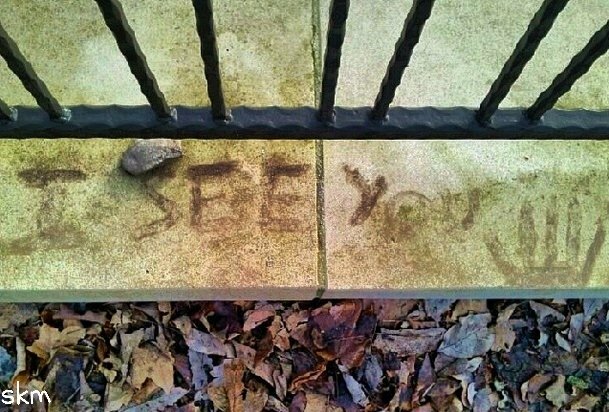 Spotted by Sara on the base of the foundation. Used to go there all the time for reasons I shouldn’t make public! Haha, Greg, I’ve heard many stories along those lines! I have always wondered about this tower. My husband calls it Frankenstein’s Castle’, and my kids are totally creeped out by it. Any idea why it was built? Is the park in charge of it, now? Would be cool to see it turned into a bat house or some other such upcycled function. We believe the tower was simply built to be a lookout tower, since it’s on an elevated piece of land. The park is maintained by the Five Rivers MetroParks, as far as we can tell. Makes absolute sense, when completed in 41′, the area wasn’t remotely as developed so it would just be a view of vast rolling meadow all the way to downtown Dayton on the river. Had a few daring escapades there myself as, of course, a teen and I never really went along with the creep hype of the place and just enjoyed the adventurousness of our questionably permissible visits,the story I always seemed to get of its original use was war related, and that didn’t add up to me so it to maybe be tied to whoever developed community golf course ,or the parks. Any info on when it was they bricked up the entrance? We did hear about there being a gate originally from older family members..this is a cool site and thanks! Been up in it a hundred times. It’s always been Frankenstein’s Castle to me and my friends. We’ve actually went to the top, even after they bared it. At the top there was a hole in the center, and there was a story that someone fell through and thats who haunts it. We’ve heard things in there, and from outside. At one point we thought we seen something in the openings higher up, but all of it could have just been in our heads. I was part of that crew the aforementioned Tony spoke about…Had to use a tree to climb in the top window. The hole at the top had a mouth painted around it. When you stood over the hole it looked like you were standing in the mouth of a giant…Frankenstein’s Castle was cool…all the beer cans at the bottom…ha! Jason, we would love to see that if you do it! That would be amazing, Jason! Cool post! I did a good bit of searching on the ‘net when I posted about this back in 2011, and never ran across the Journal Herald story. I was last inside and up top in the early 80’s, I think after an early “seal-up” job was broken down. No roof even then, and smelled like pee. Still very cool in the middle of the night. I’ve been in that thing more times than I can count. We always called the witches tower or witches castle. Back in mid 90’s a group of friends and I got up in there to the top one night. There was a hole in the top and they were lighting things on fire to see down in the hole, beer cans galore, clothes, and chicken bones… Then we heard a banshee type scream and got the hell out of there! Bout fell down the spiral staircase. Crazy times! I know for a fact that the hole in the top was broken through with a sledge hammer in the mid 80’s. I know all of the teenagers who were there, and did it. They thought that there was something in the center, because the stairs go around the outer part of the tower, leaving an open cylinder in the center. But what they found was nothing but scaffolding inside. After many years of people partying up there it began ti fill with beer cans, and other garbage. At the time the hole was no larger thane 6″ in diameter, and I haven’t been up to the top for 25+ years so i don’t know how big it became, but doubt that it was ever large enough for anyone to fall through!! And BTW the kids were caught and prosecuted by the City of Kettering for Vandalizing!! In high school in the 70’s we went to Frankenstein’s Castle several times in groups! It was so much fun and a little difficult to get into. And, I do remember the smell of pee. Ahhh, to be young again!!! Visited many times as a teenager with my best friend her boyfriend and my future exhusband. Nothing particularly scary for our visits except one night my bestie fell down the hill on the way down and landed passed out in the middle of Patterson Rd. My ex, being a wanna be paramedic, decided she needed mouth to mouth resuscitation even though she was breathing just fine. Needless to say when she came to, and him with his hands under her shirt and his mouth about to touch hers, he’s the one who got the wake up call right across the face! IV been going there since the 80s it never had a top when I went. Hold on I do think I remember once as a kid Polly 82.83 I think I vaguely remember a top But the reason I’m posting is that at some point I remember a small round table made of stone with aa ches board or like a star burst.psttern . The table was where the hole is now I figured the hole came from when they stole the table was I wish I had a penny for every can and condom wrappers down that hole lol. This is on Patterson Road, off of Dorothy Lane, by the Community Golf Course! Lol! Reading all these post brings a k memories! I remember visiting here in the late eighties early nineties had to climb in threw the window ! Don’t remember the pee smell just old musty wet wood decay smell ! The hole at the top was big enough for maybe a foot to get threw ! It was a pretty view .. the story was the lightening one , a suicide one and a witch one lol ! Didn’t see any ghost . Had also heard it was a bell tower but guess not reading now ! To bad it has to be all closed up would be nice to see it restored and opened to the public ! Great stories as one person posted spent Alot of time there with my sister and friends in the 80’s doing things that shouldn’t be made public but for all that spent time there we all know what we were usually doing Great times wish we could go and reminisce agin!!!! Visited Frankenstein Castle a lot in the late 70’s. It was spooky and the guys love to scare the girls. It was cool at the top. But as time went on people abused the poor structure. I used to talk about it to my kids when we had picnics at the huge picnic area in Hills n Dale park. A lot of memories there. We were in there a lot in the 1950’s as 10, 11, 12 year old children. We would ride our bikes from Oakwood to Hills and Dales and always stop at the “castle”. It was an adventure to climb the spiral stone staircase to the top and see the beautiful view and have picnics up there. It had the peaked roof then, which was nice. Sometimes it would be clean at the top, but sometimes smell of pee or worse. One time as a young teenager, probably about 1960, my friend and I went up and were a little alarmed to find 6 older teenage boys at the top. They started talking dirty so we made a hasty exit. Never heard any spooky stories about it but did hear it called the Hills and Dales Tower. I was disappointed to come back to Dayton years later and find it all sealed up and no roof. Would love to see it restored. Thanks for the historical research.